The pink snow blanketing the Arctic has scientists worried - and rightly so. It isn’t a new phenomenon, but scientists fear that the pink snow blanketing certain parts of the Arctic region could have huge implications for the world. According to a report from the Washington Post, researchers have shown that algae cause the pink snow in the Arctic, and it’s speeding up the pace of ice melt at an alarming rate. 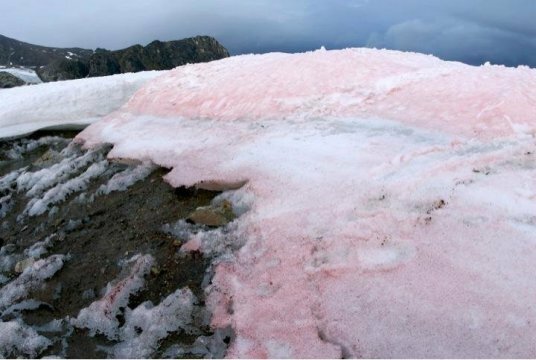 Researchers knew that the pink snow was caused by algae for some time, but the recent study reveals just how serious it is. The study, published on Wednesday in the journal Nature Communications, examined 40 samples of red snow from 16 different glaciers and snowfields in Greenland, Norway, Sweden and Iceland. Much like asphalt on a hot summer day, the dark color of the snow causes it to absorb more of the sun’s radiation. This leads to an increase in temperature, which in turn accelerates the rate of snowmelt in what scientists call a positive feedback loop. The dark algae may be driving the pace of snowmelt in the Arctic at a higher rate than previously thought. The study’s authors warn that failing to account for the effect of algae on melt rates in the Arctic would paint an inaccurate picture of the trends and forces at play in the region. Researchers are uncertain just exactly how much effect the algae responsible for the pink snow in the Arctic has on the environment, but fear that as temperatures rise, algae will continue to propagate and spread, creating even more dark surfaces that would continue to absorb light and drive snowmelt. The study, published in the journal Nature, can be found here.